It appears that the U.S. Navy is responsible for a well researched plan involving the largest solar array, and they don’t have to invest anything for it. The largest solar array, to date, in the high desert of California is the home of the new U.S. Navy 13.79 mw solar energy project and, as part of a 20 year California PPA program. China Lake is an area 120 miles from Los Angeles and home to the Naval Air Weapons station. 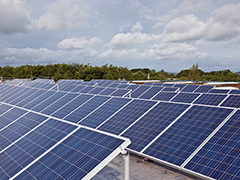 Looking for a cost effective renewable energy source for the Navy resulted in a genius plan to work with the developer, SunPower, and take advantage of the California incentive program. Due to the twenty year duration, the plan allows the Navy to utilize and buy solar array power on their land at a thirty percent discount. The long term savings that we (and that’s the citizens of the U.S.) expect to get is projected at $13 million, over the twenty year extrapolation. The area pegged for the solar array is around 6,777 acres. This visionary concept is currently being examined for other federal solar energy projects and will be used as a benchmark for the future. The U.S. Army is stepping up to the plate and has initiated a “Multiple-Award Task Order Request for Proposal” that involves around $7 billion towards the purchase of 2.1 million mw of power based on alternative energy technologies, including solar. The U.S. Department of Defense examined land owned by the U.S. government, and has determined that there is 25,000 acres that would be considered suitable for solar energy development. When you do the math, this totals to around 7,000 mw of solar power. This is just part of the U.S. plan, as they are also investigating and investing in other renewable energy technologies, including wind, biomass and geothermal. Posted on August 6th under Energy of Stars.